WASHINGTON (AFNS) — About 40 living World War II members and their relatives, as well as the families of deceased members, were in attendance as the Civil Air Patrol received the Congressional Gold Medal during a presentation Dec. 10, in the Emancipation Hall at the Capitol Visitors Center in Washington D.C. In attendance to receive a medal was Colonel George Mills Boyd USAF Ret. and former Wing Commander & Director of the Kansas department of Civil Air Patrol. Boyd also served as a Director of the Kansas Division of Aviation for the Department of Transportation. He currently serves as a board member of the Kansas Aviation Museum and is a former Tuskegee Airman. The presentation acknowledged their role in protecting the U.S. homeland against deadly German U-boat attacks during World War II and other wartime domestic missions. The Speaker of the U.S. House of Representatives John A. Boehner and other members of Congress hosted the presentation of the medal. 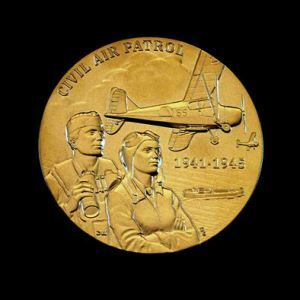 The Congressional Gold Medal is awarded to those who have performed an achievement impacting American history and culture. At times, their actions are likely recognized as a major accomplishment in the recipient’s field long after it has been completed. “It’s an honor the country is recognizing the work of the Civil Air Patrol,” said retired Maj. George M. Boyd, a Tuskegee Airman. Boyd retired from the Air Force after serving through World War II, the Korean War and Vietnam. He went on to join the Kansas Civil Air Patrol where he earned the rank of colonel. The Civil Air Patrol organization was founded Dec. 1, 1941, six days before the attack on Pearl Harbor. For more than 60 years, CAP-U.S. Air Force provided guidance, training, assistance and oversight to CAP organizations nationwide. “This medal is for all of the people who belong to the Civil Air Patrol,” said Elizabeth Wall Strohfus. Strohfus’ served in the CAP before joining the Women Airforce Service Pilots (WASP) program. Her job included training gunners on the ground and in the air by towing a long muslin sleeve behind a B-26 Marauder that was shot at with live ammunition. Hundreds of CAP-trained women pilots joined the WASP program along with other military units for women. The CAP, the official auxiliary of the Air Force, is a nonprofit organization with 59,000 members nationwide, operating a fleet of 550 aircraft. CAP, in its Air Force auxiliary role, performs about 85 percent of continental U.S. inland search and rescue missions as tasked by the Air Force Rescue Coordination Center and is credited by the AFRCC with saving an average of 70 lives annually. CAP received the World Peace Prize in 2011.